China's propaganda machine has taken aim at American soybean farmers as part of its high-stakes trade war with the Trump administration. 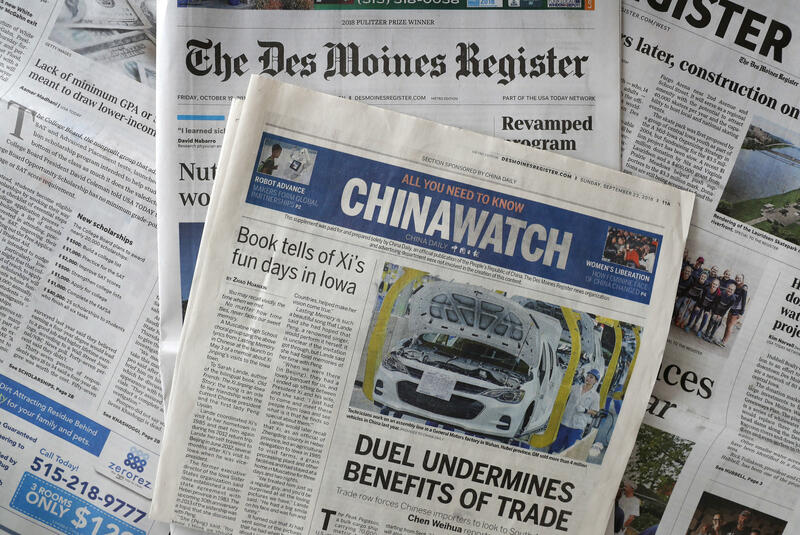 The publication last month of a four-page advertising section in the Des Moines Register opened a new battle line in China's effort to break the administration's resolve. U.S. farmers are a key political constituency for Mr. Trump, and Beijing has imposed tariffs on American soybeans as retaliation for Mr. Trump's tariffs on hundreds of billions in Chinese imports. Mr. Trump said in an address to the United Nations Security Council in September that China was interfering in the U.S. midterm elections. "Regrettably, we found that China has been attempting to interfere in our upcoming 2018 election, coming up in November, against my administration," Mr. Trump said. "They do not want me, or us, to win because I am the first president ever to challenge China on trade." "We don't want to them to meddle or interfere in our upcoming election," he said. Mr. Trump tweeted a photo of the "China Watch" edition that ran in the Register, calling it propaganda and asserting that Beijing was trying to interfere in U.S. elections.